All members of International Network of Engaged Buddhists (INEB) has expressed their concern over the brutality that the SPDC (the military regime) in Burma has been doing to its ordained monks, nuns and laypeople who call for the end of social and political sufferings in their home country. Since the uprising of the religious and ordinary people from mid September, many actions by our members has been organized, both in Thailand where the INEB Secretariat Office locates, and worldwide. Some of them are summarized below. Following the Statement from H.H. the Dalai Lama, who is our Patron, statements of support to the people of Myanmar are issued from both INEB and our international members such as Buddhist Peace Fellowship (USA), AYUS (Japan), HIKMAHBUDHI (Indonesia), BKSN (Cambodia), etc. Recently our new Patron, Ven. Bhikshuni Chao Hwei held a press conference in Taipei to share the concern from the Buddhist nuns? community. In Bangkok, the INEB Secretariat Office joins the Budhika Network of local Buddhist groups and other groups on labours, human rights and democracy campaign. We went to submit a letter requesting the Thai Sangha Council to request their action on the Burma crisis and the violence against Burmese Buddhists. Then we participated in several demonstrations. On Saturday 29 September 2007, INEB co-organized the inter-religious prayer for peace and non-violence at 7:00 pm in front of the Myanmar Embassy in Bangkok. Some monks from INEB?s member organization (Sekhiyadhamma Groups) will also join. In Chiangmai, Thai people and monks, the Burmese and NGOs are very active, too. They held demonstration and religious rituals for the Burmese who lost their lives. Of course our INEB friends are there as well. We got reports on actions done by our members worldwide. In Indonesia, HIKHMABUDHI report their demonstration to put pressure on Myanmar. BPF reported their peace action and close surveillance over the situation in Myanmar. 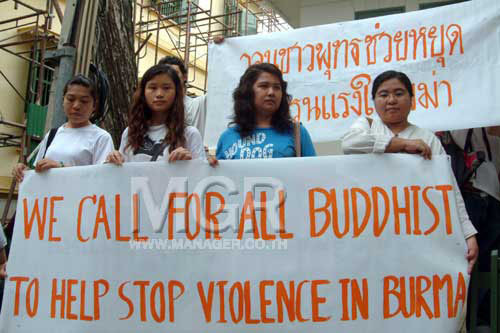 In Japan, our friends and other Buddhist groups planned the demonstration at the Myanmar Embassy also. More actions are expected to come up and will be reported to INEB soon. Our member in Burma was active in sending out the situation inside Burma to us until all the international communication mechanism was cut off by the military regime. In addition, we are constantly informed by action groups outside Myanmar on the development of the crisis. We hope that peace and righteousness will return to Myanmar soonest.